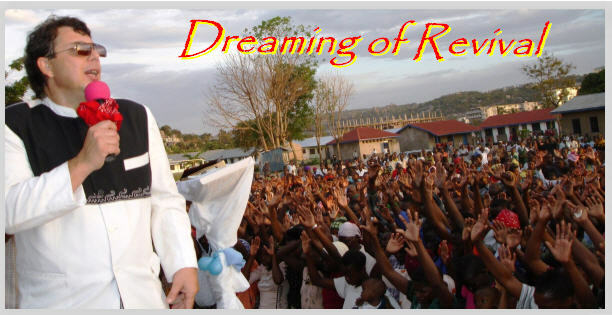 King of Glory Ministries - Writings » Dreaming of Revival - A Prophetic Word for NOW! Dreaming of Revival - A Prophetic Word for NOW! Father, I thank You for the miracles, signs, and wonders. I thank You, Father God, that You are the God of the impossible. I thank You, Father God, that with You nothing is impossible. As we move forward into this new dispensation of time, as You begin to touch Your creature—the human race, as You begin to revive us as we move closer to Your return, I thank You that You have breathed upon us to pour out Your Spirit. We say Your Spirit is welcome here with us. Holy Spirit, we invite You to come and to pour out upon us in a fresh and a new way. I believe revival is coming. Just before a conference we had in Moravian Falls, North Carolina, on Cinco de Mayo, May 5, 2015, I began to have these incredible dreams. When I would lie down, I would begin to dream about revival in our region. I saw revival coming to many states and many nations. And this happened every night between May 5 and May 15. It’s Revelation 5:5; the Lion of the tribe of Judah is roaring over our region. God has this area marked for revival. I believe the revival we are going to see is not going to look like we think it’s going to look like. It’s not going to mimic the revivals of the past. It’s not going to be like the revival with Evan Roberts in Wales, although that was fantastic and God used that to touch a whole region of a whole nation. I believe God can do that for us here in the Carolinas, and in America too! It’s not going to be like Azusa Street. It’s not going to be just a particular manifestation of the Spirit. It’s not going to be a particular move. It’s not going to be a particular person. It’s not going to be like Pensacola, as wonderful as that revival was; it’s going to be different. It’s not going to be like the Toronto Blessing, as wonderful as the outpouring in Toronto was; it’s going to be different. It’s going to be totally different from anything we’ve ever seen. As I dreamed about this, I sensed the Lord continued to breathe upon it and breathe upon it. It’s not going to be propelled by a particular gift. It’s not going to be propelled by a particular personality. It’s going to be propelled by God Himself. Just the power of God is going to come. The presence and the glory and the power of God are going to invade the atmosphere of whole cities and whole regions. And people are going to cry out and say, “What must I do to be saved?” It’s going to be a revival that’s going to be brought by unusual miracles, signs, and wonders. It’s just going to happen. Nobody is going to be laying hands on people. We are not going to be lining people up and knocking them down. No! It’s just going to be that the presence of God will come into the house so strongly, the glory of God will come into the house so strongly, that people driving by on the interstate will feel compelled to come to this place, to come to that city, to go to that church. And when they walk in, the power of God will just rest upon it like the pillar of cloud rested upon Moses’ tent, the tent of meeting. People will just come in; they will be drawn by the Spirit of God. It won’t be because of eloquent preaching or because of the manifestation of the gifts of the Holy Spirit. It will just be the power and the presence of God will invade whole regions. When this begins to happen, people will be drawn in. They will come in one way, but they will go out another. They will come in one way, but they will go out totally changed. They’ll come in oppressed, but they will go out free. They will come in sick, but they’ll go out healed. They’ll come in with cancer, but they’ll go out cancer free. They’ll come in blind, but they will go out and see. They’ll come in with deafness, but their deaf ears will be healed. All of this will happen just in the glory, just in the presence, just by the power of God. Nobody’s going to have to preach. Nobody’s going to have to lay hands. It’s just going to be an outpouring of the glory and the presence of God. Every tongue, every tribe, and every nation will experience this. There is going to be an outpouring of the power of God and the glory of God throughout the earth. It’s going to happen in many places and in many cities. I believe as this moves forward, we are going to see incredible moves of God poured out in many nations. I believe God has America on His radar. I repeat: God has America on His radar! There are some things going on in the world. There’s a shaking that’s going on in the world. It came to pass, when the trumpeters and singers were as one, to make one sound to be heard in praising and thanking the LORD, and when they lifted up their voice with the trumpets and cymbals and instruments of music, and praised the LORD, saying: “For He is good, For His mercy endures forever,” that the house, the house of the LORD, was filled with a cloud, so that the priests could not continue ministering because of the cloud; for the glory of the LORD filled the house of God. It filled the house of God! I’m telling you, there’s going to be a cloud of glory, there’s going to be a presence of God that’s going to rest on whole regions. And the priests will not be able to stand to minister. In other words, what we have done for so many years, our priestly duties—we do praise and worship, announcements, take offerings, and all the other things that we do, the things we know how to do—we are not going to be able to do those things. For the glory of God is going to fill the house! The glory of God is going to come down and the men and the women of God will not be able to speak, they will not be able to minister. People will be drawn in, and in that atmosphere of glory, people’s lives will be transformed. In that atmosphere of glory people will be healed. In that atmosphere of glory people will be saved and changed and transformed and delivered. Hallelujah! Are you ready? There is nothing we can do because it’s already on God’s agenda. It’s already going to happen. All we can do is prepare a place for His presence. And the most important place that you need to begin to prepare for the presence of this revival, for the presence of God, is right in your heart. When we prepare our heart, we prepare our sphere of influence to receive the cloud. And when the cloud comes down and rests upon the temple, there will be no need for words. People will be touched by the power of God. People will be touched by the presence of the Father. This revival is not going to be about personalities. It’s not going to be about denominations. This revival will be about the presence and the glory of God. In the glory miracles happen. People will come in and they will be transformed in the glory. It won’t be that they will come to hear a man speak eloquently or to teach or preach the Gospel or to prophesy or to work miracles or to minister healing. They will be drawn in by the power of the Father. They will be drawn in by the glory of God. The pillar will come down. When the praises go up, the glory comes down, “For He is good, For His mercy endures forever.” He is good and His mercy endures forever! Hallelujah! Lives are going to be changed in the presence of God. It’s not going to be a chore. The Scripture says His people will volunteer freely in the day of His power (Psalm 110:3, NASB). Listen, saints; the day of His Power is at hand. The glory of God will begin to visit many states and many nations. The glory of God will begin to visit ministries. The glory of God will begin to rest on certain churches. The question becomes: will they embrace it? Because it’s happened in the past where the glory of God has come down and rested upon cities and rested upon ministries but they didn’t embrace it; they didn’t receive it. In fact, they quenched the Spirit of God and it lifted. My question for you is: when the glory of God rests upon you, what’s your response going to be? Are you going to receive it even if it looks like something you are unfamiliar with? Are you going to embrace it even if it’s outside your doctrinal view? If the glory of God comes down and shakes your paradigm in the way that you believe God should move, how are you going to react? We should not judge the manifestations of God we do not understand. How does that happen? Heaven is released upon earth. How does that happen? The glory cloud comes down and rests in a place; and in the glory, the Kingdom comes. In the glory, miracles happen. In the glory, people’s lives are transformed. In the glory, people no longer want to enter into sexual immorality. In the glory, people no longer want to be involved in drug abuse and drug addiction. In the glory, people no longer want to become involved in things that draw them away from God. In the glory, you are drawn closer to the person of Jesus. The glory will draw you closer to the Lord Jesus Christ. And in that place of intimacy, the glory will begin to rub off on you. And when the glory of God begins to rub off on you, then you will be transformed into a glory carrier. You will be like that young man Joshua, the son of Nun. The Scripture says when Moses went up to the tent of meeting that the pillar of cloud would come down and rest there. And Moses would go in and he would speak to God face-to-face, as a man does to a friend, but then he would go back to the camp. (See Exodus 33:7-11.) But the scripture goes on to tell us that Joshua the son of Nun rested or lingered in the tent. He rested in the glory. He received an impartation from the glory that transformed him into someone that could lead the nation into the Promised Land. God wants to raise up a generation like Joshua—who will just want to linger and rest in the glory of God; who will be transformed by the power and the presence of the Father, by the power and the presence of the person of the Holy Spirit; who will see Jesus; who will know Jesus; who will submit to the Trinity; who will begin to walk in amazing levels of power and miracles and signs and wonders. It’s going to be a fresh outpouring of the Kingdom of God. It's Revival! God is about to take the church and the Body of Christ to a new level in the Kingdom. He is going to take us into the realms of glory where we are going to learn to operate in the Power of the Father. We are going to begin to operate in something greater than the gifts of Spirit, as wonderful as the gifts of the Spirit are. I love the gifts of the Spirit. I believe in the gifts of the Spirit. I operate in the gifts of the Spirit. I believe that God will always release the gifts of the Spirit to those who believe. But in the glory of God, the gifts of the Spirit are multiplied and accelerated. In the glory of God the anointing of the Holy Spirit that rests upon a person, that rests upon a ministry, that rests upon an entire region can be multiplied and transformed. And the Power of God will be released in unprecedented ways. It’s not going to look like we think it’s going to look like. In fact, it may be messy. What I’m talking about is the love of God. On the Day of Atonement as I sat on a white rocking chair on our property right in the center of Moravian Falls, I heard the audible voice of the Father speak to me. He spoke to me out of the Book of Hebrews. I believe this is what God is doing. I believe you can be a part of it. God is no respecter of persons (Romans 2:11; Acts 10:34, KJV). I sat there in Moravian Falls, and the power and the presence of God came down. It was a beautiful day, the sun was shining, and the glory of God began to roll in, in wave after wave after wave after wave. I was just sitting on that chair embracing the glory, luxuriating in the glory, and worshipping God and thanking Him for the blessings he had poured out upon my life. Remember, He is good and His mercy endures forever (Psalm 118:1-4, 29; 136). If you want cultivate the glory of God in your life, give God thanksgiving for the things He does. Lord, You are good and Your mercy endures forever. And as I was in that place, I felt the power of God come down in a way I haven’t experienced in years. And the earth literally began to shake. In that moment I felt the glory of God fall upon me. And I heard the Father speak from His throne of mercy and grace in the heavenly realms. We find it in Hebrews 12:26-. As I was there, the Father spoke this: He said, “The time has come for Me to shake not only the earth but also the heavens.” In that moment I was released into a trance or a vision, if you will. I began to see the earth shake and quake. I began to see the glory of God being poured out in many places. I know that the earth is going through a shaking right now; but the shaking we are experiencing is the mercy of God. What we are experiencing in the natural realm in the world with all these different crises, is just God. God is shaking the nations of the earth. God is shaking whole people groups. God is shaking the entire earth. But this shaking is really His love, because it is the love and goodness of God that draws men unto repentance (Romans 2:4). America is being shaken. God is not angry with us; well, not all of us—think about that. It’s His mercy; it’s His love. Behold what manner of love the Father has bestowed on us, that we should be called children of God! Therefore the world does not know us, because it did not know Him. Beloved, now we are children of God; and it has not yet been revealed [visibly manifested] what we shall be, but we know that when He is revealed, we shall be like Him, for we shall see Him as He is. I am the true vine, and My Father is the vinedresser. Every branch in Me that does not bear fruit He takes away; and every branch that bears fruit He prunes, that it may bear more fruit. You are already clean because of the word which I have spoken to you. Abide in Me, and I in you. As the branch cannot bear fruit of itself, unless it abides in the vine, neither can you, unless you abide in Me. I am the vine, you are the branches. He who abides in Me, and I in him, bears much fruit; for without Me you can do nothing. As the Father loved Me, I also have loved you; abide in My love. If you keep My commandments, you will abide in My love, just as I have kept My Father’s commandments and abide in His love. These things I have spoken to you, that My joy may remain in you, and that your joy may be full. This is My commandment, that you love one another as I have loved you. Greater love has no one than this, than to lay down one’s life for his friends. You are My friends if you do whatever I command you. Father, help me to love Your people the way that You love me. I’m not always successful, but I’m asking for the grace of God to help me. I believe that God is looking for a place where He can come and pour out His Power, pour out His glory, and pour out His love—unconditionally. It doesn’t matter what tribe, what tongue, what nation you are of; God is looking for a place where people can come into the presence and the glory of God. And in that place the love of God, the glory of God will transform them. It’s not going to be so much about the ministry of the saints; it’s going to be the ministry of God the Father, God the Son, and God the Holy Spirit. I am expecting that there is going to be a day come when someone will stand up and open their mouth and the Power of God is going to come in such an unprecedented way that we will all fall upon our face, like we saw when the ark of the covenant was brought into Solomon’s Temple when the priests could not stand because the glory of God filled the house (2 Chronicles 5:14; 1 Kings 8:11, KJV). We will not be able to stand to minister. That is what is going to happen. God is going to pour out His Spirit in such an unprecedented way that no man will be able to put his fingerprints upon that revival. Because it is going to be obvious to everyone that God is in the house. It’s going to be obvious to everyone: this is the Spirit of the living God. They’ll just come in and fall down on their face and say, “What must I do to be saved?” It will be a revival of Power and a revival of glory that will be propelled by the love of God. And He is preparing a people at this hour who can steward it. He is preparing a group of overcomers, if you will, who can step into this mantle. They will understand that if we can allow God to have His way then His Kingdom truly can come and His will truly can be done in our lives, in our churches, in our ministries on earth as it is in heaven. This revival is going to sweep our whole region. When? I’m not sure. But I know this: it’s going to be released as we learn to love one another. It’s going to be released as we give the Lord time to come down like that cloud, like that pillar on Moses’ tent. Scripture tell us that after of the finished work of Jesus—when He died on the cross; when He shed His blood to make payment and atonement for our sins; when He took those stripes upon His back for the healing of our bodies; when He was buried in that unused grave; when He rose up after three days, that glorious resurrection day when He rose up and ascended to sit at the right hand of the Father; and when He prayed to the Father; the Father sent a Helper, He sent the Holy Spirit. In Luke 3:21-22 it says that Jesus prayed and the heavens opened and the Holy Spirit descended bodily in the form of a dove and everyone there heard God the Father speak and say, “You are My beloved Son; in you I am well pleased”; that was the first time in millennia that God the Father, God the Son, and God the Holy Spirit had all been in one place upon the earth. I prophesy to you that God the Father, God the Son, and God the Holy Spirit are coming again. They are going to come in an unprecedented wave of Power (Matthew 26:64). They are going to come and release the Power of God in whole regions where the pillar of cloud will come down and rest upon men and women, upon ministries, and upon whole regions, where the tangible glory of God will be so strong that people won’t want to go to the games, they won’t want to go to the bars. They are going to want to go and get into the glory of God and into the presence of God. And in that place there will be transformation. In that place the nation itself can be changed and saved in a day. It’s going to be a sovereign move of God. Nobody will be able to put their fingerprints on it because it will be undeniable the glory of God the Father, the glory of God the Son, and the glory of God the Holy Spirit that will be at work. I’m excited about it. I am uncertain of what it’s going to look like, but I know it is coming. I want to encourage you to prepare your heart. God is pruning us. God is taking away from us everything that hinders us from being like His Son, Jesus. He’s pruning us; every sinful thing He’s taking away from us. He wants us to be transformed. He wants to be vessels worthy to carry His presence and to carry His glory. He wants to transform who we are so that we can transform out sphere of influence. He wants to pour His Spirit and His glory upon each of us in such an unprecedented way that we will in turn re-create Christ in our sphere of influence. Do you know what that is called? It’s called Revival. It’s coming. Not only that but revival is here! You can walk in it now! You can walk in miracles, signs, wonders now! However, the greater revival is going to come in a way we haven’t expected. It’s going to come at a time when we are not prepared. And it’s going to come when we are least ready for it. But it will come. Make no question about it; it is coming. Lord Jesus, I ask that You would let me be fully submitted to You. Holy Spirit, the Scripture tells me in Romans 5:5 that the love of God has been poured out in my heart by the Holy Spirit who was given to me. Lord, I thank You that I am Your son (daughter). And I thank You, God, that You will keep no good thing from me. I ask that You would help me to contain Your love. Holy Spirit, help me to understand the love that the Father poured out through His Son Jesus. Lord, I ask that You would help me to submit to the refining fire of the Holy Spirit. Father, I ask You and I give You permission to begin to prune away from me anything that keeps me from walking in Your fullness. And, Lord, I ask You in Jesus’ name to let me be that tent of meeting. Let me be that tabernacle. Let that cloud of smoke, that pillar of glory come down upon me. Let it come, Lord. Thank You, Jesus. You might want to play worship music in the background. The Spirit of the living God is present to minister to you. I ask you to speak to the Holy Spirit. And if the Lord begins to show you anything in your life that you need to repent of, just do that. Open up your spirit to the Spirit of God. Father, we thank You for the ministry of the Holy Spirit. Father, we thank You for the revival that’s coming. We decree that revival is coming in our lives. We submit to the refining fire of Your Spirit. Father, we say spark that revival in my heart first. Prepare me first, O God, to be a vessel to carry Your glory. Holy Spirit, I ask that You would speak to us all. Give us wisdom and revelation in Jesus’ name. Dialog with the Spirit of the living God. Allow Him to begin pruning. To help you with the process, you might want to take the Lord’s Supper. I believe there is something that happens when you take Communion. There is a supernatural exchange that takes place. When Kathy, my wife, and I receive the Lord’s Supper, we ask Him to try us and to show us anything within us that keeps us from drawing closer to Him. Perhaps He may show you something. Take a moment and quietly dialog with God and ask Him to prepare you, to prune you, to forgive you if necessary. If the Holy Spirit shows you something or you feel conviction about something, ask the Lord to make it real to you and then repent. And don’t forget to give God praise. Thank Him for the wonderful things He has done in your life, all the blessings He has given unto you. Just take a moment to thank Him and remember everything He has done for you. Remember the finished work of Jesus. Remember Jesus, the Son of the living God who takes away the sins of the world. Remember that by His blood we are transformed into sons of the living God. If you need healing, this is a good time to pull on heaven to receive your healing. Remember to give God all the honor and the glory and the praise for every good thing. Lord, I thank You for every person who is reading this article, and I ask You to bless them, in the name of Jesus. This article was taken from Kevin Basconi's upcoming book; "Angelic Visitations and other Supernatural Experiences Volume #2". This book is due to be released in November 2015. To shop for Kevin's other books click HERE. To get the FREE audio of this timely message click HERE. This article was written by Kevin Basconi, for King of Glory Ministries International, PO Box 903, Moravian Falls, NC 28654. www.kingofgloryministries.org -336-818-1210. This article is an aspect of the new iMAEC. Preaching the Gospel of the Kingdom to the ends of the earth from the very heart of Moravian Falls, North Carolina. Look for our new digital campus coming soon! Please feel free to forward this link or article. However, we ask that you leave our contact information on all forwards, links or reprints of this material. All Rights Reserved. No part of this article may be reproduced or transmitted in any form or by any means—electronic or mechanical, including photocopying, recording, or by any information storage and retrieval system—without written permission from the authors except as provided by the copyright laws of the United States of America. Unauthorized reproduction is a violation of federal as well as spiritual laws.